There is no better place in California to be an egg-laying chicken than the green pastures of Burroughs Family Farms. 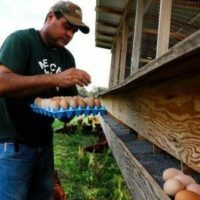 Heriberto, Benina, Mariana and Ward Montes are raising a pasture full of certified-organic, grass-eating, bug-hunting, sunshine-loving laying hens and 885 acres of almonds and olives, all organic or in transition. Heriberto handles the day-to-day work with the birds and Benina manages the administrative and design work involved in keeping the business going. Mariana, Ward and Juliana 4, 2 and 2 months take care of keeping them both busy. [Their] birds are raised and rotated on pasture with mobile hen houses with fresh air and plenty of exercise. You can be assured that [the] eggs are nutrient dense in vitamins A & D, so vital for our body systems to perform at peak performance. There is nothing as tasty as an organic, grass based, fresh egg – we hope you enjoy them as much as our family does!